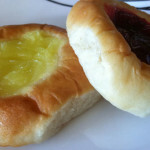 A huge thank you to Julie for submitting this scrumptious family kolache recipe! Living in the Czech Capital of the USA, kolaches are aplenty all year round. Everyone’s grandma or mom makes kolaches for family gatherings. The tragedy in this is that most people who are not of Czech descent have no idea what a kolache is. Take a look at the photo and then try making them yourself. A kolach is a delicious pastry that holds fruit, surrounded by a puffy cushion of dough. Remove from stove and add oleo, salt and sugar. Stir until melted. Cool to lukewarm. Dissolve yeast in warm water. Beat eggs; add potato flakes, then add the cooled milk and yeast. Add flour; you can add more if you need it. Put in greased bowl. Let rise. Make golf ball sized balls of dough. Roll the small dough balls by cupping the dough in your hand and rolling with the other (the goal is no seams in the dough ball). Place on cookie sheet. Let rise. Punch down each ball (the bottom of a juice glass works well). Fill with fruit filling (cherry, apricot, poppy seed, prunes, pineapple, apple, peach, cottage cheese, cream cheese, etc). Bake for 15-20 minutes at 375 degrees. Grease the kolaches when they come out of the oven (only the dough part – the Czech ladies use a feather brush for greasing). Don’t worry if your first batch doesn’t turn out great. It takes practice to make the perfect kolache. 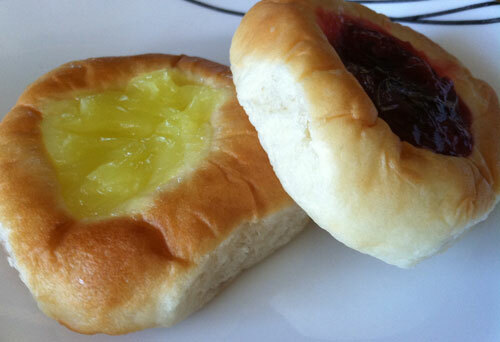 Please share your pictures and stories when you try making your own kolaches! Very excited to try this recipe as my grandmother from Schuyler made kolaches all of the time but for some reason no one knows where her recipe is and she has past away a number of years ago…these look just like hers. I am hoping to surprise my family by making some of these! Thanks again!!! Hi Susan! I actually had a contributor write this post that is from around that area, yea 😉 Thanks for stopping by!